Are you looking for brighter and tighter skin? Are you concerned about skin discolouration or a dull complexion? Do you wish you could help erase fine lines and wrinkles? A peel can help you address these skin care concerns and restore a more radiant complexion. A peel (also known as chemexfoliation or derma peeling) is a chemical treatment used to diminish signs of ageing on the face, neck, chest, and hands. Skin care professionals can use peels to treat certain conditions that discolour and age the skin, such as acne, age spots, freckles, melasma, and fine lines. During treatment, a chemical solution is applied to the skin, which makes it ‘blister’ and eventually peel off. The new skin underneath is smoother and less wrinkled than the old skin, leading to a more radiant, youthful appearance. Who is a good candidate for a peel? Generally, fair-skinned and light-haired clients are better candidates for chemical peels. Clients with darker skin may also have good results depending on the type of skin concern being treated. However, darker-skinned clients may be more likely to have an uneven skin tone following a chemical peel. Which skincare line do you use for peels at Silhouette Spa and Laser? We are pleased to offer the Image Skincare line at Silhouette Spa and Laser. 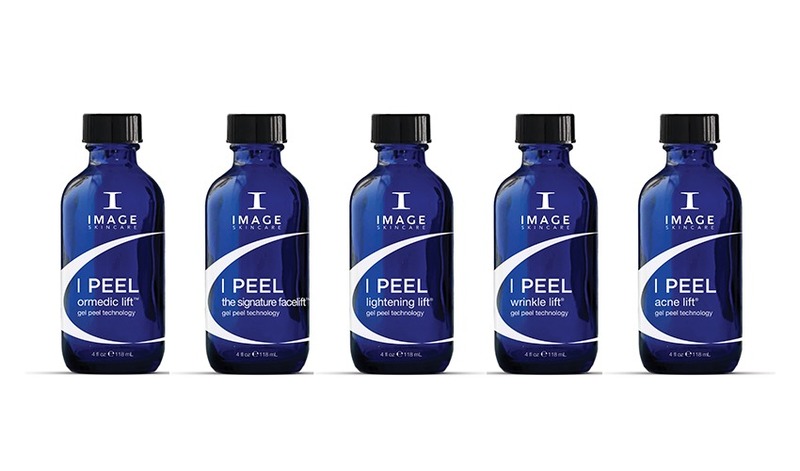 Image is a results-oriented skin care line created by chemists and physicians. The specially-designed peel solutions peel off dry, dull skin and reveal a fresh, radiant complexion underneath. All Image products do not contain silicones or petrochemicals, and all chemical preservatives (such as parabens) are replaced with natural and plant-derived preservatives. All fragrance used in the Image line is 100% essential oil-based. Furthermore, the Image line is cruelty-free and is not tested on animals. What types of Image peels do you offer at Silhouette Spa and Laser? Image’s signature, results-driven treatment will change the appearance of your skin in a single treatment. Vitamin C, alpha and beta hydroxy acids, and gentle yet effective enzymes speed up cellular turnover, leading to lighter, tighter, and brighter skin. The signature facelift solution is suitable for all skin types, even sensitive skin. Key benefits: Vitamin C and fruit enzymes blended in aloe vera combined with anti-inflammatory botanicals help to reduce redness. Hyaluronic acid adds moisture to dry and dehydrated skin. The signature facelift solution gently exfoliates the skin while infusing it with potent anti- oxidants. The wrinkle lift solution is an ultra-resurfacing blend of glycolic and retinol which visibly reduces the appearance of fine lines and wrinkles. Treated skin is left feeling firm and looking revitalized. Key benefits: The anti-ageing blend of glycolic, retinol, and botanical lighteners in an aloe vera gel base help correct, repair, and rejuvenate ageing skin. How do the active ingredients in Image’s chemical peel solutions work? Image’s signature facelift solution contains alpha hydroxy acids (AHAs), naturally-occurring fruit acids. Glycolic acid (derived from sugar cane) is a commonly used AHA for the treatment of ageing and skin discolouration as it stimulates the cellular turnover process. Image’s signature facelift solution also contains beta hydroxy acids (BHAs), which are excellent chemical exfoliants. They work by breaking up the buildup of the outermost layers of skin to reveal younger, healthier skin beneath. BHAs also help reduce the appearance of fine lines, wrinkles, acne scars, and mild skin discolouration. Image’s wrinkle lift solution contains the AHA glycolic acid, as well as retinol. Retinol (a type of retinoid made from Vitamin A) is an effective and powerful option for treating skin issues ranging from acne to signs of ageing. Retinoids work by preventing the buildup of dead cells in the skin’s pores and follicles and by promoting the growth of healthy cells, leading to a more youthful appearance. How do I prepare my skin for my peel appointment? 1) Avoid facial waxing for one week prior to your peel. 2) Avoid Retin-A products for one week prior to your peel. 3) Avoid using retinol products for three days prior to your peel. 4) Avoid using glycolic acid for 24 hours prior to your peel. What can I expect during a peel? Before receiving a chemical peel, you may need to follow a pre-peel skin care routine for 2 to 4 weeks to improve results and reduce any potential side effects; your esthetician will let you know if this is necessary. During your peel appointment, your skin will be thoroughly cleansed prior to treatment. After your skin is prepped, your esthetician will apply the selected peel quickly and evenly to specific areas of your skin. This creates a controlled wound which allows new skin underneath to take its place. Following application, your esthetician will observe your skin carefully and remove the peel at the appropriate time. Once the peel has been removed, your esthetician will treat your skin as needed based on the type of peel you have received. This usually includes the application of cool compresses followed by lotion or cream to soothe your skin. During a chemical peel, most clients will feel a burning sensation that lasts between five to ten minutes, followed by a stinging sensation. Cool compresses applied to your skin following treatment help ease this stinging sensation and soothe your skin. How long does a peel appointment last? Each peel appointment lasts approximately 40 minutes. Clients can expect a reaction similar to a sunburn following a chemical peel. A peel treatment generally involves redness followed by scaling that ends after three to seven days. How do I care for my skin after my peel appointment? 1) Avoid direct sunlight or indoor tanning for two weeks after your peel. 2) Avoid facial waxing for one week after your peel. 3) Avoid physical activity/sweating for 24 hours after your peel as this can reactivate the tingling sensation from your peel. 4) Do not pick, peel or scratch your skin while your skin is healing to avoid scarring and infection. 5) Do not use any abrasive exfoliating products while skin is healing. 6) Use the post peel kit provided to you to help your skin heal properly for best results. 7) After your skin heals, apply broad-spectrum sunscreen with a minimum SPF of 30 daily to help maintain results. 8) Do not hesitate to call us if you have any questions or concerns. What are the possible side effects of a chemical peel? How long will the results of a peel last? Chemical peels can temporarily improve the appearance of skin by reducing discolouration and fine lines. However, the results of a chemical peel are not permanent as skin continues to age over time. Therefore, it is essential to proactively protect your skin by avoiding sun exposure and wearing broad-spectrum sunscreen with a minimum SPF of 30 daily. Are you interested in trying an Image peel? At Silhouette Spa and Laser, we offer a variety of peels in addition to other skin care services such as facials and body care treatments to keep your skin looking its best. Call us today to book your skin care appointment! Skin Laboratory: Why Are Acids Used in Chemical Peels?